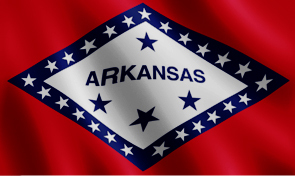 The current Arkansas flag was inspired by the contest entry design of a woman named Willie Kavanaugh Hocker in 1912. Through many adaptations, the Arkansas state flag has come to represent many different aspects of the great state. The diamond shape in the center represents Arkansas as the only diamond producing state in the nation. The 25 stars around the diamond symbolize Arkansas as the 25th state admitted to the union. There are also three stars underneath "ARKANSAS" which represent Spain, France and the United States – the three countries the territory belonged to, 1803 – the year the U.S. acquired Arkansas as part of the Louisiana Purchase, and Arkansas being the third state created from the purchase. The single star above the state name represents membership in the Confederate States of America.